Naturforscher, Pionier der Lichtmikroskopie (1632-1723). 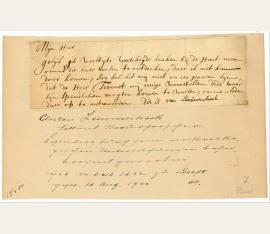 Autograph letter fragment. [Wohl Delft. Ca. 184 x 58 mm, montiert auf Papierträger mit späterem Sammlervermerk (ca. 222 x 138 mm). The beginning of an unpublished letter to an unidentified recipient. It often happens to him, writes van Leeuwenhoek, that he finds himself working on matters the full import of which he does not grasp, and so he would be glad to learn the opinions of Mr. Tevenot (i.e., the French scholar Melchisédech Thévenot, 1620-92): "Myn Heer. Gelijk ik veeltijts verschijde saaken bij de Hant neem omme die haer wesen te ontdecken, daer ik niet kan door komen, soo sal het mij niet onaengenaem sijn, dat de Heer Tevenot mij eenige voorstellen dede waar sijn speculatien mogten komen te vallen, omme alsdan daer op te antwoorden". - In 1683 van Leeuwenhoek wrote to Heinsius: "I have heard Mr. H. van Bleyswyk's high praise of Mons. Thevenot, and I am anxious to hear what that learned and curious gentleman will say about my statements" (Leeuwenhoek, Alle de brieven IV, no. 78). In 1688 he wrote to Thévenot directly: "A few years ago I took the liberty to send you a few of my modest ideas and observations, to which Your Honour replied in courteous terms. Now it so happens that, among several observations, I have discovered the circulation of the blood [...]" (ibid., vol. VIII, no. 111). The present fragment would seem to belong to the context of the former letter. - Identified by a slightly later hand on the leaf itself ("Dit is van Leeuwenhoek"); the backing paper has a note by a German 19th century collector. - The Delft entrepreneur van Leeuwenhoek is one of the most notable representatives of the golden age of Dutch science and technology. A draper by trade and a largely self-taught amateur scientist, he pioneered the field of microscopy and is hailed as the "Father of Microbiology". His instruments, built by a secret and carefully guarded method, achieved magnification of up to 275 times and more - a resolution not reproduced until more than two centuries after his death. "[O]ne can say with truth that [...] protozoology, bacteriology and microbiology begin with Leeuwenhoek" (PMM 166). 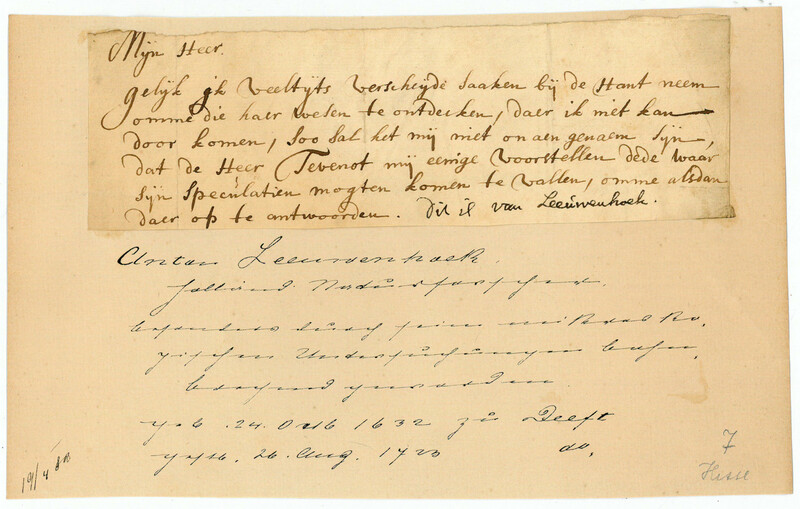 Autographs by Leeuwenhoek are of the utmost rarity; not a single specimen has been traced in trade records..